The Tar River Writing Project is part of a national network of sites located in universities around the United States. 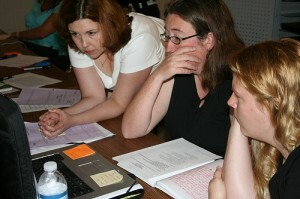 Each site conducts a Summer Institute devoted to writing and improving the teaching of writing, in addition to sponsoring Professional Development Workshops during the school year. Sites also design programs that address local issues and the particular needs of schools, teachers, and students in their communities. 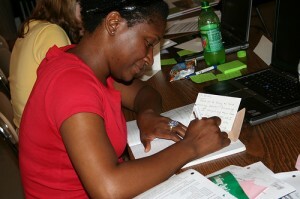 The TRWP strives to help teachers become even better teachers of writing. Our primary method for accomplishing that work is the Summer Institute (SI), an invitation-only, four-week workshop for experienced teachers. In the SI, teacher-participants share their knowledge with each other and sharpen their own teaching through inquiry, reading, and writing, as well as through preparing a teaching demonstration that highlights their own “best practices” in teaching writing to their students. The Tar River Writing Project is endorsed by North Carolina Department of Public Instruction to offer professional development for K-12 teachers in North Carolina. Schools may use Title I, Title II, and NCLB funds to pay for TRWP professional development events. National research continues to demonstrate that student writing in the classrooms of Writing Project-trained teachers outpaces those of students in other classrooms.